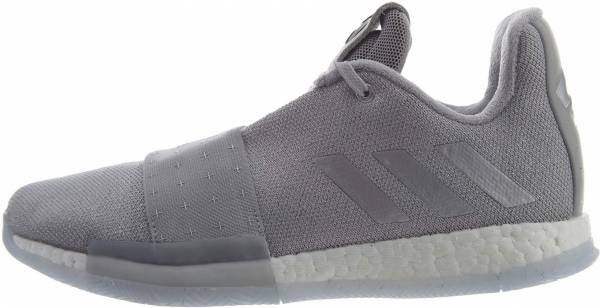 The solid outsole rubber of the Adidas Harden Vol 3 is praised by many testers because it barely attracts dust. The herringbone traction pattern delivers great stopping power, claim most wearers. For a lot of users, the thickness of the Boost midsole is just perfect. A large number of buyers mention that the textile uppers of these technologically advanced low-top basketball shoes feel premium. Most wearers are happy with the lightness of the Adidas Harden Vol 3. Several say that the huge heel tab makes it so much easier to put the shoe on. The majority of owners claim that the Vol 3 positively deviates from the previous Harden signature models. Many are happy with the design of the Adidas Harden Vol 3. For many users, the Adidas Harden Vol 3 is the best Harden basketball shoe ever. The Adidas Harden Vol 3 is not for outdoor use according to most reviewers. They claim that the grooves in the outsole are soft and easily wear off. A few users complain that the insoles of these Adidas basketball sneakers are paper thin which make them feel the strobel board uncomfortably. Some wearers are upset that the elastic band at the forefoot does not help with the lockdown. They claim that it is only for aesthetic purposes. A handful of testers mention that wide footers should watch out for the fit of these Harden basketball shoes. They say the shoe runs a little narrow. For some buyers, these Adidas basketball shoes lack ankle support because of their low collars. A huge number of shoppers think that the Harden Vol 3 looks like a soccer shoe. The Adidas Harden Vol 3 is generally considered a great performance shoe. Reviewers can’t express enough how much they enjoy playing in these signature sneakers from James Harden and Adidas. The shoes are so good that some have decided to get a second pair as a backup or for casual use. The adidas Harden Vol 3 might not look like much, but its performance on the court is nearly perfect. I’ve said this recently in a video — I wish I could remember which one — but sometimes simplicity garners the best results. There is nothing special about the Harden Vol 3, but the Harden Vol 3 is a special shoe. Its so simple that it does everything right. Some would say they played it safe, but if all you want is a shoe that hits every aspect you could want on a shoe then playing it safe might’ve been the best way to go. This is the best performer of 2018. That's how nice these are and that's how much, I'm gonna get like five pairs of these. These are insane. You're super low to the ground. It's just very minimal but it's just so responsive as well. Like the traction is insane. Cushion - very, very nice, and a blend of everything that I love. It just does everything. I definitely recommend them. If you guys want a good performer, get the Harden Vol 3. Plain and simple: the Harden Vol 3 is the best Harden shoe we have seen yet. The design may, in some eyes, be taking a step back but performance has never been better. If you are a player at any position who enjoys freedom of movement, court feel with above-average impact protection, and a great fit look no further — the Harden Vol 3 is a serious shoe. If you enjoy a little more supportive feel or just don’t like “The Beard” then I guess you can look elsewhere, but you’ll be missing out. James Harden’s love for low-top basketball sneakers has produced a third signature model. Senior footwear director Rashad Williams designed the third Harden model around the time James won the 2018 MVP Award. The shoe takes inspiration from NASA and its rockets. The Harden Vol 3 comes with a full-length Boost, which is Adidas’s most responsive midsole technology. The outsole rubber features a herringbone traction pattern for an unstoppable court performance. For a comfortable wear, the Flyknit upper is durable and flexible. Cushion. The responsiveness of the Adidas Harden Vol 3 comes from the full-length Boost in its midsole. Because the foam technology is more exposed than the one in the Vol 2, the Vol 3 is bouncier at the heel especially during landing. With a minimal cage on the lateral side, the forefoot Boost is able to deliver great court feel. Traction. Depending on the colorway, the Adidas Harden Vol 3 comes in either solid or translucent outsole rubber. It is suggested that the signature shoe be used indoors. The rubber outsole features a full-length herringbone pattern. It allows wearers to control quick cuts and change directions smoothly. Length and Width. The Adidas Harden Vol 3 is quite narrow straight out of the box and gives a snug fit. After a short break-in time, the material stretches and the shoe provides a one-to-one fit. As for those who already have a pair of Harden Vol 2s, they can get the same size for their Vol 3. Lockdown. These Adidas basketball shoes utilizes the traditional lacing system. For extra lockdown, the Adidas Harden Vol 3 features a stretchable band on the forefoot. The upper of the Adidas Harden Vol 3 is made of Flyknit. It is comfortable and flexible for any movement. The forefoot has a fuse overlay for durability. The Adidas Harden Vol 3 is a low-top just like James Harden’s previous signature and lifestyle shoes. The number thirteen in roman numerals graces the medial side, while on the lateral side the Three Stripes are found. The elastic band on the forefoot features James Harden’s signature. As for Harden’s logo, it is displayed on the tongue and outsole. The “adidas” callout is found at the heel. The Drew League was established in 1973 in Los Angeles. High-profile NBA players including James Harden play in the league from time to time. In collaboration with the Drew League, Adidas came up with a college purple pair with black, red, and aqua accents. Released on November 2, 2018, the Coral colorway vibrantly contrasts with the existing colorways of the Adidas Harden Vol 3. These Harden basketball shoes are dressed in shades of bold coral. The Boost midsole is white. It retails for $160 a pair. The Cosmos colorway comes with a core black upper with cloud white and grey detailing. The Cosmos colorway is said to have defenders lost in space. The Voyager colorway has a grey upper with silver metallic and aero blue accents. The colors represent Harden’s hardship to win another title for the Houston Rockets. Paying tribute to his signature stepback move, the Wanted colorway is a white pair with a black strap and gold accents throughout. The translucent outsole is printed with a wanted poster from the Wild Wild West. On the medial side, the “the QUICKEST STEPBACK” is printed. The wide pull tab has the “WANTED,” “adidas,” and Adidas logo. The Adidas Harden Vol 3 released additional two basic colorways–Core Black/Cloud White/True Blue and Core Black/Active Blue/Solid Grey.